These cards were produced as promotional giveaways for the long out-of-print 36-card Beat Generation boxed set, released on the 40th anniversary of "Howl.". 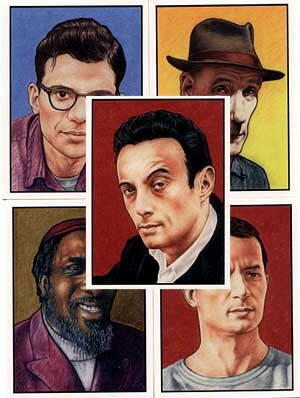 Five of the best known '50s beatniks were selected to promote the larger set: Lenny Bruce (No. 1), William Burroughs (No. 2), Allen Ginsberg (No. 3), Jack Kerouac (No. 4) and Thelonious Monk (No. 5). All are expertly rendered by Jesse Crumb, son of Robert Crumb. If you have the Beat Generation card set, you've noticed that the Jack Kerouac card has a black silhouette where the author of On the Road should be. That's because Kerouac's daughter threatened to sue publisher Kitchen Sink Press if the set was released with her father's portrait. But these promotional cards, already released, were unaffected. Excellent items for non-sports card collectors or beat fans. These also frame quite nicely for any hip pad.